Just after 10:00 pm ET, NASA’s Jet Propulsion Laboratory (JPL) confirmed that the solar panels on its Mars InSight lander had deployed and the batteries were charging. The good news, almost 7 hours after the landing, was accompanied by a second photo of InSight’s landing site. This one was taken from a second camera whose lens was not covered in dust, so provides a much better look at the landscape. A little earlier in the day, JPL also released an image that was taken by one of the two MarCO cubesats as it passed Mars, further demonstrating the utility of these tiny satellites for interplanetary studies. 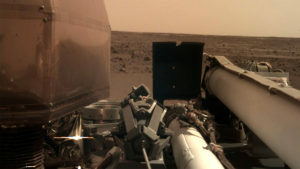 The second surface image was taken by the Instrument Deployment Camera located on the deck of the InSight lander. InSight has two cameras, both of which were launched with lens covers that will be jettisoned in the days ahead. The first image that came back was taken by a camera that was exposed to dust kicked up during the landing and its view was partially obscured by dust particles on the lens cap. The second camera is in a more protected location and its image of the aptly nicknamed Red Planet is quite clear, showing the flat, relatively boulder-free Elysium Planitia, which was chosen precisely for those qualities. Second image from NASA’s InSight lander from its landing site on Mars, taken by the Instrument Deployment Camera, Nov. 26, 2018. Credit: NASA/JPL-Caltech. In the foreground are the instruments and other equipment on the deck of the lander. InSight carries a seismometer (SEIS) provided by the French space agency CNES, other European science institutes, and JPL, and a Heat Flow and Physics Properties Probe (HP3) provided by the German space agency, DLR. Both will be placed onto the surface using a robotic arm. This image was relayed back to Earth via NASA’s Mars Odyssey spacecraft, which has been orbiting Mars since 2001. It and the Mars Reconnaissance Orbiter (MRO), which arrived at Mars in 2006, are both equipped with communications packages that relay signals from spacecraft on the surface of Mars back to Earth. The first image, taken moments after landing, and other data acquired during the entry, descent and landing (EDL) sequence were relayed through two tiny cubesats, MarCO-A and MarCo-B, that were designed to do exactly that. The briefcase-sized technology demonstration satellites were launched with InSight and separated from it once they were enroute to Mars. While the use of cubesats in Earth orbit for everything from student experiments to commercial remote sensing is common, these are the first to be sent on an interplanetary mission. They followed InSight throughout the almost 7-month journey so they could relay the EDL data in real-time. Otherwise NASA would have had to wait several hours for the data to be sent back through MRO and Odyssey once they were in the correct orbital position to do that. 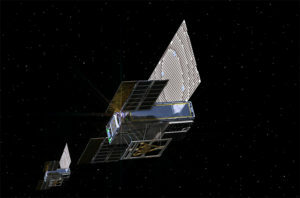 Artist’s illustration of a MarCO cubesat. Credit: NASA/JPL-Caltech. The stowed size of one of these cubesats is 14.4 inches (36.6 centimeters) by 9.5 inches (24.3 centimeters) by 4.6 inches (11.8 centimeters). InSight Science Instruments Operations Coordinator Elizabeth Barrett explained that they will now take some time to study the landing site and determine just where to place the instruments on the surface. They have a “Mars yard” at JPL where they can simulate the surface of Mars and practice each maneuver before doing it for real on Mars. SEIS will sit on the surface. The HP3 has a probe (“mole”) that will drill down as many as 16 feet into Mars to measure its heat flow (temperature). It will take 2-3 months to deploy the instruments, followed by a month for calibrating them. InSight stands for Interior Exploration using Seismic Investigations, Geodesy and Heat Transport. It is the first spacecraft designed to study the interior of Mars. In the near term, however, NASA has only one more Mars mission on the books — the robotic Mars 2020 rover. It will collect and store (“cache”) samples that are intended to be returned to Earth by other robotic spacecraft, but NASA has no funded projects to do that. In addition, MRO and Odyssey are quite old and if surface operations are to continue, new orbiters will be needed to relay signals from the surface back to Earth. When that day will come is an unknown. Rep. John Culberson (R-TX), the most ardent congressional advocate for NASA’s planetary exploration program and chairman of the House appropriations subcommittee that funds NASA, lost his reelection bid. While there are other champions in Congress for NASA science programs, none have the same passion for planetary exploration versus NASA’s other science activities — astrophysics, heliophysics, and Earth science. NASA also must come up with money to pay for a steep overrun on the James Webb Space Telescope. It will require an additional $490 million in FY2020 and FY2021 above its planned budget to meet its most recent launch date of March 2021. At the same time, Trump has directed all agencies to propose budgets that are five percent less than current spending. Against that backdrop, finding money for more Mars missions will be a challenge. Then again, the President and Vice President are happy about today’s landing, and the top Democrat in the Senate, Minority Leader Chuck Schumer (D-NY), was among the members of Congress tweeting congratulations. I remember that first time Americans set foot on the moon. And I feel that same wonder every time @NASA pushes us farther and farther out into the universe.